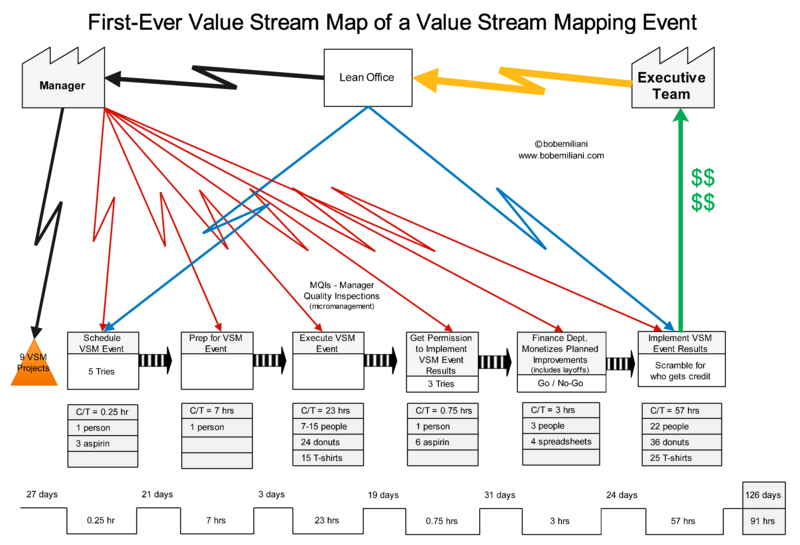 Is it time to get rid of value stream maps? 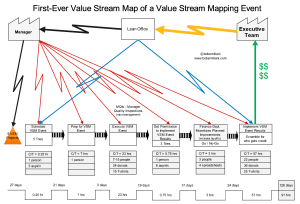 The first-ever value stream map of a value stream mapping event reveals mountains of waste. The lead-time to achieve actual improvement has increased by 425 percent! Some are calling this a “Lean crisis.” Others are calling it a “Lean disaster.” Whatever the name, the real problem is the same as the perceived problem. Yikes! How often does that happen? The burning platform is no longer burning! It’s been extinguished by an a tidal wave of non-Lean thinking. Oh, the humanity! This is the worst thing I’ve ever witnessed. Lean management experts finally recognize the problem and are rushing to produce A3 reports to determine the root cause of the problem and identify countermeasures. But will anyone listen? Will companies implement the countermeasures? The very survival of Lean management is at stake. Can you point me in the direction to where I can read more about this? Hi Barney – This post was intended to raise awareness (through a bit of satire) of a problem that has been around for a long time but remains largely ignored. That is, the bureaucratization of Lean overall – and especially in relation to specific tools such as value stream maps – which makes improvement go slow, rather than as it should be: fast. I’ve written about this in Better Thinking, Better Results and the REAL LEAN and Kaizen Heart and Mind books series, and also in a recent blog post “Lean Heresy.” Bureaucratization (or corporatization) of Lean adds complexity and greatly slows down improvement. The one regret that nearly every leader has is: “I wish we would have gone faster.” Bureaucratizing Lean guarantees that will always be leaders’ regret. I used to be responsible for a 3-shift operation at Pratt & Whitney in Connecticut and did not experience many problems. Sure, union members and their reps were skeptical of Lean and worried that management had ulterior motives such as layoffs. In general, I find union members are no more of a problem than physicians or professors when it comes to Lean. Anyone who knows little about process improvement is skeptical, mainly because they fear bad outcomes that will affect their work or livelihoods. I have long been of the opinion that union leaders need to understand REAL LEAN and hold management accountable for practicing that (vs. Fake Lean). Doing so would be better for everyone. Defining the problem is important here. It’s not that VSM is bad. It’s that it often takes too long or gets bogged down in software. I’ve done mapping in every company imaginable and it’s never taken more than a day. Even at a massive gold mine. It always yields valuable and important insights. As an analogy, I kinda like my dentist to examine every tooth and maybe take an X-Ray before drilling at random. It does become a problem if the dental examination takes hours. Also – A reasonable amount of bureaucracy is good. It especially helps in a large distributed company where there can be lots of scrutiny, and potential wasted effort. I agree; defining the problem is important. The problem I sought to narrowly define was when: 1) a tool becomes the thing that people focus on most; 2) when this focus turns the tool into something never intended (VSM events); and 3) when people do not recognize there is a problem – meaning, 1) and 2) – and, in particular, improvement going very slowly. This indicates that Lean principles and practices have been altered by normal management practices, where going slow is seen as OK.
Just goes to show that anything can be improved. Value Stream mapping is just a tool in the evolution of Lean. Everything must improve or die. In 50 years I expect even VSM will be a dinosaur in the annals of lean thinking. As I have understood, I find it interesting that Mike Rother wrote about “Learning to see” fifteen years ago, where the VSM method were thoroughly described, now in “Toyota Kata” underlines that we shouldn’t analyze too much, but start working with the improvements. “Set up Vision and Target Condition, list obstacles, go through PDCA and develop countermeasures on the process you want to improve”. As I understand this, we should develop a quite rough VSM to show the big picture, and then choose a part of the Value Stream to go into in more detail with an improvement process. Eventually choose two processes and develop a cross functional VSM between them. Is it right understood that this could bring us down to a Kaizen, where we make small everyday improvements, managed by improvement teams, working with their own challenges, instead of big improvement projects managed by expert teams outside the line organization working with the whole Value Stream as a project? Are we too keen on Pareto analyzes based on statistical proofs, the cost/value analyses and big projects itself instead of, in fact, doing everyday improvements?